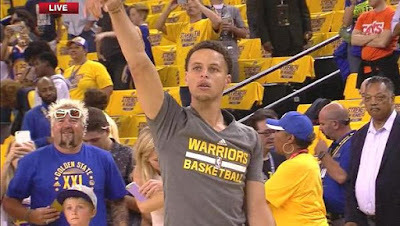 Guy Fieri sat courtside last night during Game 1 of the NBA finals and images/video of him have been circulating the Internet. 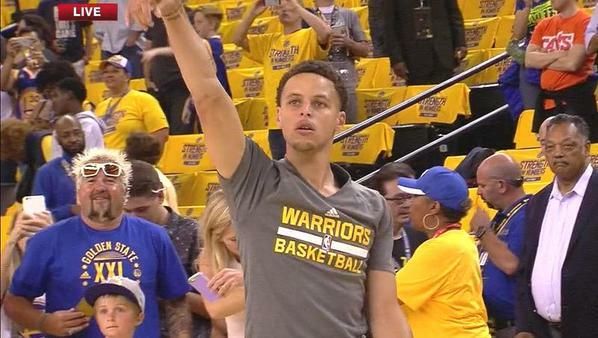 Here is a Vine of Guy looking pretty impressed while watching Steph Curry warm up. It also seems that @Fierify is pretty busy fulfilling requests to Fierify people today, so feel free to reach out to him. A good businessman and leader should never feel outnumbered, you have to put EGO aside and when someone with more intelligence and expertise in a certain area gives great feedback...UTILIZE IT! Do what is best for the business. There is no pride in authorship! By the way, for a front of the house person, it seems Shaun could be a little more gracious and present when customers come in and set a good example for the service staff. Perhaps attend a course on hospitality. I wonder is Guy Ferry thinks that is a good look, or if he is just embracing the Jersey D-bag look for attention and turning it all up to 11 for laughs. Who wears nugget pinky and thumb rings except to be ironic? And the sunglasses! I felt just like you. I don't understand why this was considered to be newsworthy. I also can't understand why anyone in his right mind would want to emulate Guy's schtick. Hmmmm - Maybe that's the answer. You know Mo, I wonder if he really is as enamored as all that or if FN wants him to talk him up a bit. I can't help but think the network is trying to push "young and hip" to reach a broader (younger) audience. However he is not the way to go as he is not a good representation of his age group He is more of a "tool" than that of someone with their finger on the pulse of the youth. We all understand twitter...his ideas are just stupid.JMO. I think what Jeff likes is the entertainment value of Matthew as the imminent train wreck that he is. I don't believe Jeff wants Matthew to win FNS or thinks he has the goods to helm a show and maintain a loyal audience. I think what Jeff likes is how much he enjoys watching Matthew make a fool of himself each week. Cleavage shots and skirts that are about 4-5" too short, but I'm just sick of looking at her in general. He definitely needs no help in the ego department. I thought it was condescending also. I know she meant to help, but she didn't think how it would come off. Of course his comeback was terribly mean I thought. You can always learn something from people, whether they are your peers or not. I didn't realize that. How annoying. Oh, I hope Jeff Mauro isn't really enamoured with him and is just putting on a song and dance for the network! I like Jeff. I wholeheartedly agree regarding how obnoxious the mom lady was. I disagree with your assessment of Jay as "Lenny 2.0". I ignore them both at this point. Every year there has been a female villain, this year the villain is a male. NFNS has someone to add some spice to the pot......get the viewers blood pressure up. I wonder how Matthew would have reacted had she said, "As someone a bit older" rather than "As a mom." Would it have sounded more advisory and less like a lecture? Either way, I'm sure Matthew would have come up with a nasty response. I was thinking of Jay as another Tom purely on physical appearance and energy level. As far as cooking chops go, so far I'd put Jay in the superior position. It's her gum-baring grin that gets me. I'd swear she's had extra teeth implanted. Her over pronunciation of Italian words gets to me. It's like somehow that makes her an expert. She has no credibility with me and her princess attitude is just annoying. Do you think the Mauro thing is something FN told him to write to juice ratings? What if one of the upcoming stars in messing with a married person? Her overpronunciation of Italian words and her immodest apparel are what get to me. Oh, this is so on point. Just today she was on t.v. in the other room and couldn't even pronounce spaghetti without being pretentious. That's not the vibe I get from Flay at all. I think he is tired of the side show acts that the FN makes the contestants go through. He just wants to eat good food and judge it. It takes years of practice and experience to be comfortable in front of a camera. But the FN is like "Hi, welcome! You have 30 seconds to figure out how to be perfect in front of a camera. Ready? Go!" Reading a bit more about Lenny on this site, I will say Jay seems like a nicer person than Lenny. He just came across as Lenny/Guy's man in waiting but i read Jeff's blog on FN and I agree Jay seems more authentic. At least the shades were on the front of his head. As someone that has lived in NJ for 30 years, I can assure you that is not a Jersey D-bag look. Bleached blonde hair is 100% California surfer D-bag look. You are right, that is not really Jersey. He has that Vegas gold nugget jewelry. He could pass for the father of the Jersey Shore show kids though. I think he scours the country for the worst looks. He did have a total Mullet at one point. Lennys persona was a total fraud but the man could cook. I like Jay. He seems down to earth and genuine. So far, it seems he can cook too and his POV is very clear. Haha, that's hilarious! He definitely pass for the Jersey Shore kids' father. "Here's the situation. I got lobster cooking in the pot but the ladies want crabs. Maybe I can give them both?" Yeah, the show has become rather stale, at least to me. I think new judges would be a start. But honestly, I'm kind of tired of a lot of the Foodnetwork personalities so I can't think of anyone. Maybe, search beyond? I was an early fan of Min Tsai. I like G. Garvin too. Not sure if they'd be a match for the show....but just thinking beyond the usual suspects. ....and countering that, Michael Symon is a big Cleveland Cavaliers fan. (Note - I'm not a Cavs fan). I like Jay a lot too....I just didn't understand why Emilia wasn't put up for elimination rather than Christina, given the fact that Bobby and Giada keep harping on the fact that she wasn't coming across as "fun". Of course I can understand why Matthew was kept around, lol! I don't watch his show and haven't seen him in years but I must say he's gotten pretty fat...that whole Billy Idol dyed blonde spiked hair and 70's fu manchu thing is looking as tired and dated as his bad food. They seem to be favoring Don, especially Guada. His on camera work continues to be poor but they just keep making excuses and saving him, what's up with that? Considering that Shaun lost his home and never had the chance to get married while his stupid friend and wife are smug, cut him some slack. At $3 million in debt, it's gonna take at least 30 years at 10k monthly profit minimum just to pay back all that debt and we're only talking principal here.